Vultr – A cloud services provider based on 100% SSD Hardware with 15 Optimized locations worldwide. Vultr provides ultra fast KVM based cloud servers in 15 cities around the globe for just $0.004/hr. Vultr has 512Mb RAM VPS Hosting plan for $2.5/month which is extremely cheap in the cloud market. I have used Vultr VPS service for over 2 years and it was just awesome, very robust service, amazing performance with 2.4 Ghz Intel CPUs and solid-state drive (SSD). In order to support the customers, many attractive promotion programs are provided regularly by Vultr, not only just for new accounts but also for existing ones. There are currently no active promotional codes. Please check back periodically for new promotions. 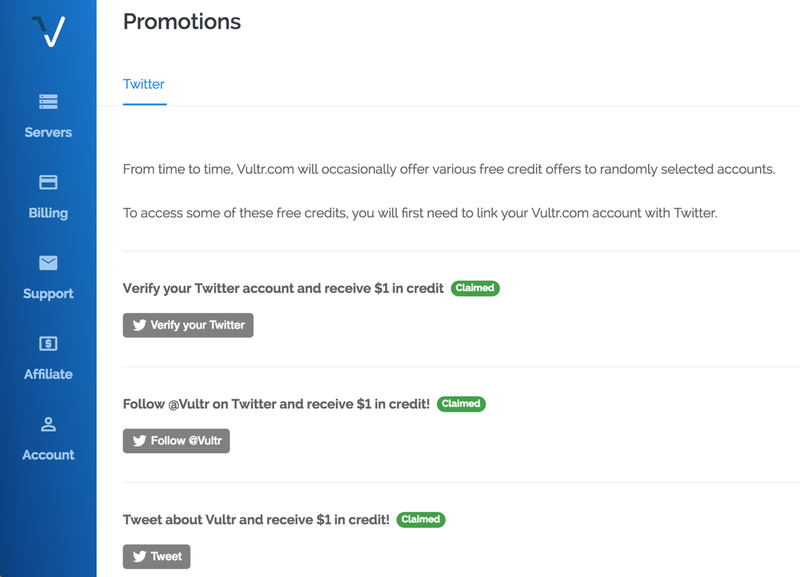 Go to Vultr’s Twitter Promotion Page, click to follow @Vultr, tweet about Vultr and get addition $3 free credit. 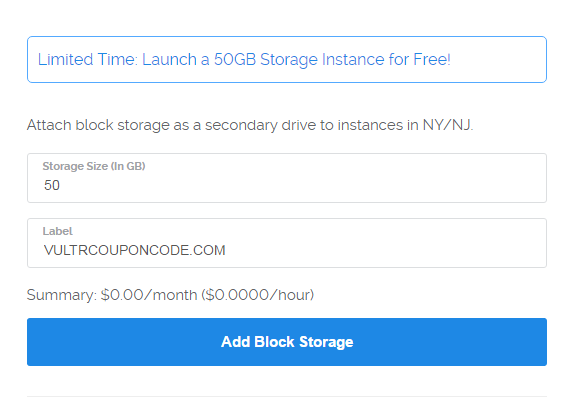 In order to give customers a chance to test the additional Block Storage, Vultr is giving a free trial program of 50GB Block Storage for all of its customers, applied for New York, New Jersey location. Logging into your account (or signing up a new one if you haven’t got yet). Choose Block Storage and press Add Block Storage button. Keep the Storage size at 50GB, fill the Label box. Press Add Block Storage and waiting until the process of creating Block Storage is completed, you can add extra storage to any VPS located in New York, NJ. Block Storage is a good solution when you need more storage space, but do not require the additional processing power or memory. Let take advantage of this chance and save your money with Vultr. is it work creddits $100? 100$ promotion works with debit card or credit card, both are ok.
about 100$ promotion, what’s the minimum amount to fund in order to get 100$? Is it working still? 100$? Shame there is no new coupons like free trial, etc. Unfortunately, all promotions expired, except Vultr Match. When $2.5 server will be available ? Vultr seems to have been selling at loss providing this pack, so the company must temporary stop it. I have no idea when it will be available again. You can order $2.50 cloud server NOW, with Miami and New York datacenter. What’s coupon code are you using? 100$ promotion works with paypal? Yes, it does. You can use credit card or PayPal account. Why do the offer on web page 2.5$ instances and then they are temporarily sold out when you have paid? Are they cheating customers? Hi. Can i order 2.5$ vultr in singapore datacenter? Available? If 2.5 dollars hosting for vps in Miami and new york . Does the Vultr provide free block storage for new York? Even if it s $2.5 ? Please email me your answer thanks. Yes, you can receive free block storage with $2.5 plan. Sorry, all Vultr coupon code currently expired. I will update new coupons if they have.